A vibrant solution to organize binder documents for easy referencing. Easily find important sections with colourful translucent Insertable Big Tab™. Dividers are made of a durable, flexible plastic that is PVC-free and stands-up to frequent use. A vibrant solution to organize binder documents for easy referencing. Easily find important sections with colourful translucent Insertable Big Tab™. Dividers are made of a durable, flexible plastic that is PVC-free and stands-up to frequent use. Featuring larger Big Tabs that offer 1.5x times more printing space on tabs for bigger fonts or extra text than standard tabs. 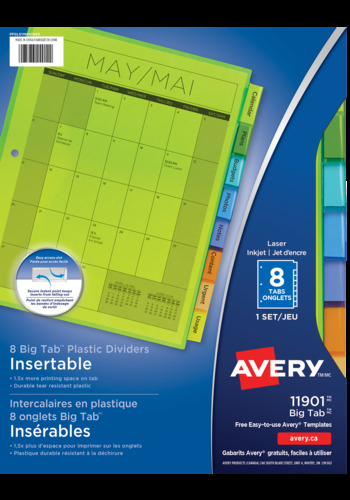 Customize tab inserts with free templates on Avery® Design & Print Online to easily create professional-looking tabs in minutes. The easy-access notch at the top of the tabs lets you slide inserts in and out with ease, while a secure indent point at the base keeps your inserts from falling out. Simplicity is key with these fun dividers. Secure indent points at the base of the insertable tab prevents labels from falling out. Avery's Big Tabs are bigger than typical tabs.